Link Build to ranking and success! Link building is one of the core SEO activities. A websites authority, reputation and ultimately ranking with search engines, is tied in with the number of quality incoming links (backlinks) it has. 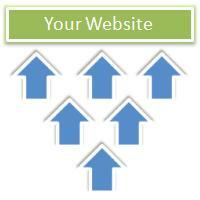 Link building also provides new avenues that visitors can use to find your website. This article aims to guide you in the best practices of link building and well as provide you ideas on where to get good incoming links. Link building can be time consuming, especially if you are disorganised. In addition to that you will need to write several paragraphs that describe your business. I personally write a new description each time one is required. I can then ensure the description relates well to the website in question. It may also increase the links respect as search engines like originality. I keep a copy of all the descriptions I have used as they can be good for inspiration. Your description should be designed to sell your business. Talk about the benefits a visitor will get if they work with you. Add a call to action to entice them to enter your website. To get the most from the search engines, do your keyword research and use that knowledge when writing your descriptions or link text. I recommend you document all your activities, especially the URLs you submit to and any login details you receive. You will find later that you may want to return to some websites to update details. You can do this in a simple text or word document. Security Advice: Due to link building I have login details for hundreds of websites, not all of which I fully trust. Because of this I use a different password for every one. I also use a secure password application called KeePass to manage and protect them. You want to hang around with the right groups and avoid associating yourself with the wrong crowd. Warning! You may receive spam emails related to link exchanges or link farms. These will not help your website! In most cases they are designed to promote someone else's website, at potentially your expense. Getting links from some websites will not help your rating with Search Engines. This is because they tell the search engines not to give you any credit (using the nofollow directive). Twitter, many forums and directories will not pass on the credit to you. The reason is these websites want to deter spamming and keep their content quality high. Not passing on the credit means SEO spammers will not get anything out of it. All is not lost though, as we are not spammers. As we are creating quality links back to your website, we are creating new avenues for people to find you. A third of the traffic to this website is due to this sort of referral traffic. You probably work with quite a few businesses, and they will have their own websites. Why not ask them to add a link to you. If appropriate, offer them a link back. This form of link-exchange is acceptable. And don't forget to register with Google My Business to get yourself on local Google search results and maps. Most business markets will have directories dedicated to listing businesses in that market. Search for keywords in your industry and add the word +directory to your search. Do you know of, or can you find websites that are the central hub of information related to your business? Getting a FREE listing maybe hard, but they can be good places to advertise. Affiliate systems are based on the idea of you paying a referral fee if they send you a customer. Normally as a percentage of the sale. Thus affiliates would be quite happy to link to your website as they may profit from it. The system would require a reliable tracking system. There are 1,000s of groups and forums out there, some of them are related to your business. These are places where people are asking questions, and experts are helping them out. Becoming one of those experts can enhance your reputation and potentially generate leads. In most systems you can create a profile or a signature that you can make link back to your website. Warning: You must provide a positive contribution to the discussions you participate in. Blatant plugging, spamming or flaming can get you banned and will not increase your reputation. Blogs are all the rage. Having your own blog and syndicating it (RSS) can be a good way to create a following. Warning: An inactive blog has a negative effect. If you decide to create a blog, make sure you dedicate some time to it, every week. Web 2.0 and social networking has recently added a new angle to promoting websites. Facebook and Twitter are the big players. Create a Facebook Page for your business and a Twitter account to provide status updates and news. Why don't you get started by becoming a fan of Web Site Advantage in Facebook and then follow me on Twitter. Promote them on your website and in your newsletters. Create some accounts and get bookmarking! At the end of this article you will see some social bookmarking link. That is one of the ways to encourage visitors to bookmark your pages. Try it out! Your best backlinks are the ones that are picked up by the Search Engines. There are tools out there to help you find which backlinks have been discovered. You can not only use these tools to check your progress, but they can be a great souce of link building ideas if you apply them to your competition. Here's an article that does a Comparison of popular backlink tools.